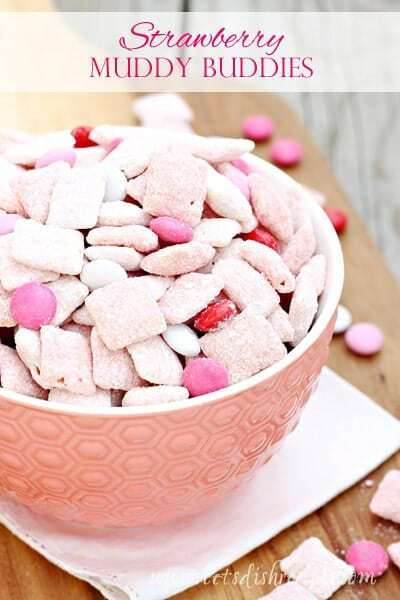 STRAWBERRY MUDDY BUDDIES — Strawberry cake mix, candy coated chocolate pieces and a white chocolate coating offer a fun twist on this classic treat made with Chex cereal. It doesn’t seem to matter what kind of Muddy Buddies I make, they never last long. 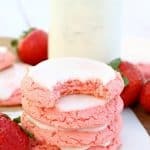 And these Strawberry Muddy Buddies are probably the best variation I’ve tried so far! My friend brought them to a youth group activity and I went out the very next morning to buy the ingredients so I could make more Thankfully I live with several hungry teenagers, or I could easily eat the whole batch myself. 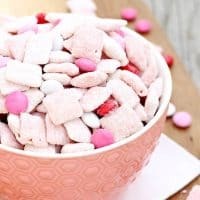 These Muddy Buddies are delicious any time of year, but they’re especially great for Valentine’s Day. I doubled the batch so we had some to take to neighbors. All you need is some cute Valentine themed treat bags and you have something fun and delicious to share with friends. And if you’re allowed to bring homemade treats to your school parties, these would definitely be a hit! But don’t wait for a special occasion to make these Strawberry Muddy Buddies. They’re so easy! 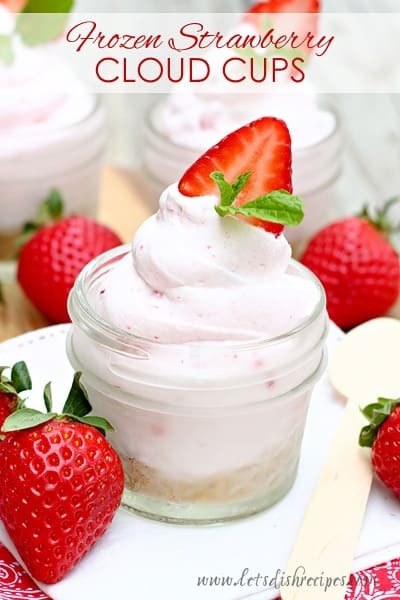 You can whip up a batch in about 15 minutes, and everyone will love you for it! Be sure to save this recipe for Strawberry Muddy Buddies to your favorite Pinterest board for later. Strawberry cake mix, candy coated chocolate pieces and a white chocolate coating offer a fun twist on this classic treat made with Chex cereal. Divide strawberry cake mix and powdered sugar between two, gallon-sized zip top bags. (1/2 cup of cake mix and 1/4 cup of powdered sugar per bag). Set aside. Divide the Chex cereal between 2 large bowls. Place half of the chocolate in a microwave safe bowl and cook at 50% power for 1 minute. Stir and continue cooking at 50% power for 30 second intervals until completely melted and smooth. Pour the melted chocolate into one bowl of cereal and stir to coat well. Place the coated cereal into one of the zip top bags. Seal and shake the bag until the cereal is evenly coated. Melt the remaining chocolate in another microwave safe bowl. Stir in 2-3 drops of red food coloring and mix well. Pour the chocolate over the remaining cereal and stir to coat well. Place the cereal in the second zip top bag and shake to coat. Combine the two bags of cereal in a large bowl and toss in the M&Ms. Enjoy! 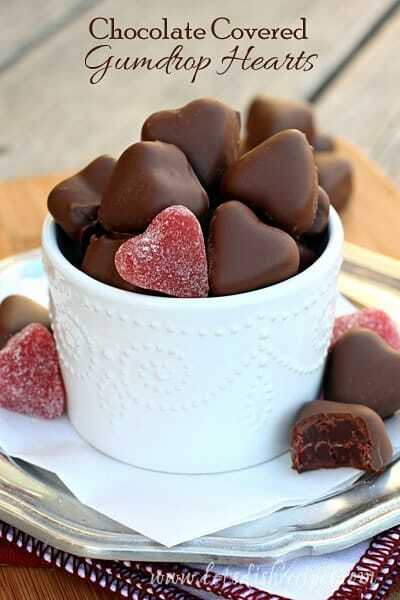 You can use 6 ounces of red candy melts, instead of coloring half of your chocolate. I just prefer the taste of white chocolate.